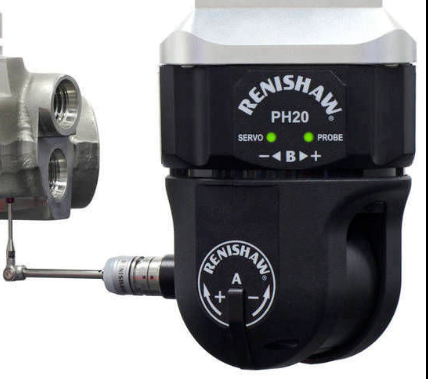 PH20 CMM Scanning Probe - CMM Inc.
Renishaw’s PH20 scanning probe has the ability to completely transform the performance of a CMM machine. This tool offers unique technology for rapid touch-trigger measurement, and has fast infinite 5-axis positioning to guarantee optimal feature access. It also has a compact design and is the perfect solution for retrofitting the vast majority of existing CMM touch-trigger installations. Unlike conventional touch-trigger measurement methods, points can be taken faster and with improved accuracy and repeatability using the PH20. The PH20 will also align itself with the part coordinate system, avoiding stylus collisions and the requirement for accurate fixtures. Furthermore, the PH20 guarantees optimal feature access and minimizes stylus changes - thanks to itsinfinite positioning capability. The synchronized motion along the 5-axis allows larger parts to be measured on the CMM by minimising the space required around the part for head rotation. PH20’s ‘inferred calibration’ technique is uniquely designed and specifically developed for this product. This technique will determine the head’s orientation and probe positioning in a single operation. Furthermore, with this type of calibration, modules will only require a few touches before use, on the calibration sphere. Users of the PH20 probe head will instantly have access to the range of proven TP20 probe modules. The detachable modules provide crash protection and also can be repeatedly changed using the MCR20 change rack.